Financial advisors, if you’re not blogging, its time to start. We’re not asking you to jump on the bandwagon just because everyone else is (and they are), but because you need to. Blogging is important for your SEO and connecting with prospects and clients, but even more significantly, it is absolutely essential to grow your business. According to Social Media Today, blogs are rated as the fifth most trusted source of accurate online information. To compete in the financial services industry and pull ahead, you have to start blogging if you haven’t already and do it better. Why do it at all if you’re not going to do it well, right? Today we’re giving you our playbook to create top content for your own advisor blog. Want to know the best part? It’s easy – at least with Twenty Over Ten it is! Blogging is one of the simplest activities you can add to your marketing strategy and doing it well takes a bit more effort. You might think creating blog content that your clients and prospects actually want to read is a difficult task, but we’ve taken the guesswork out of blogging for you. Not only is this type of digital currency one of the most searched topics in 2017, but it has been extremely popular on social media. It seems that everyone is talking about it, but only on a expert level. More likely than not, your clients have heard of bitcoin, but don’t even know what it really is. This is your opportunity to showcase your expertise and answers the questions your clients and prospects really want to know. What is it? Should they invest in it? Is it safe? You have the ability to blog about bitcoin and be a resource for website visitors. Twenty Over Ten client, Quarry Hill Advisors, have asked and answered the Bitcoin question for their blog readers. Retirement is a topic everyone has to think about as some point, or should think about anyways. Analytics show that people of all generations, including Baby Boomers and Millennials, are looking for answers. Because retirement procedures are not common knowledge, individuals eventually seek advice from family, friends, and you guessed it, the internet. Many financial planners provide retirement services and are already giving advice on the topic. If you have the knowledge handy, it’s even easier to write about. 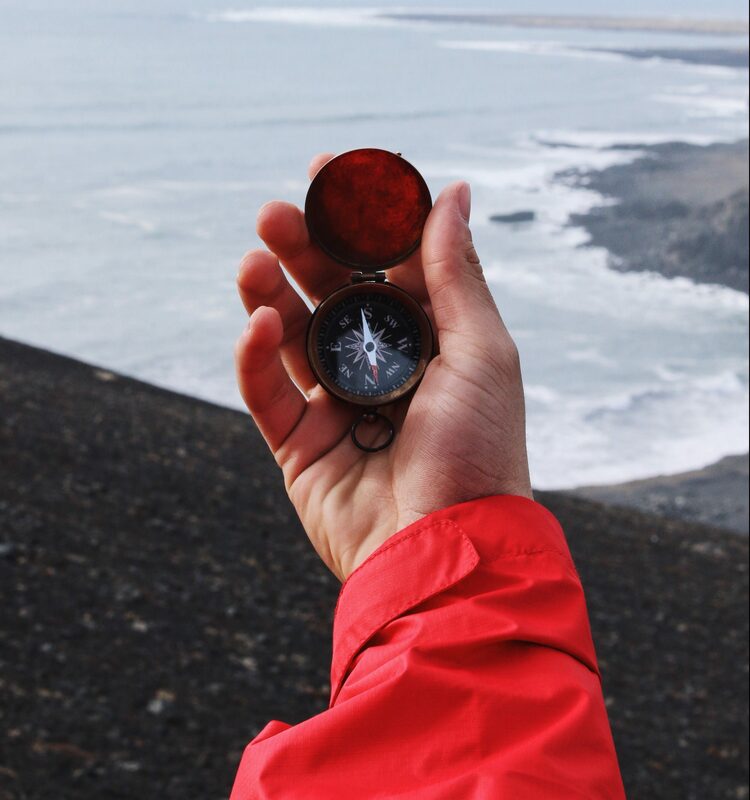 Retirement is an extensive topic so think about the opportunity to start a series covering other retirement matters such as the difference between a traditional IRA and Roth IRA, how to save for retirement, and how early someone can retire. You’re the expert and you know what retirement questions are asked the most frequently by clients; use those FAQs to build more general blog posts for clients and prospects alike. Google trends also shows that “retirement calculator” and “social security calculator” prove to be trendy. We’re not recommending you add these calculators to your website, but you could include keywords for SEO and provide advice that is more beneficial than that of a calculator. Your advice is meaningful. Someone may search for “When to start saving for retirement,” find your blog post in the results, and consequently, convert from a prospect to a new lead. In fall 2017, some 20.4 million students are expected to attend American colleges and universities, constituting an increase of about 5.1 million since fall 2000. Whether these students or their parents are in your target market, you have a great opportunity to capitalize on their questions. Before they decide to utilize a financial planner, they will try to find their answers online. If you provide a blog post with valuable advice, you can begin to build a relationship with prospects and gain their trust. When they do want to commit to an advisor, you can bet this will keep your business top of mind. 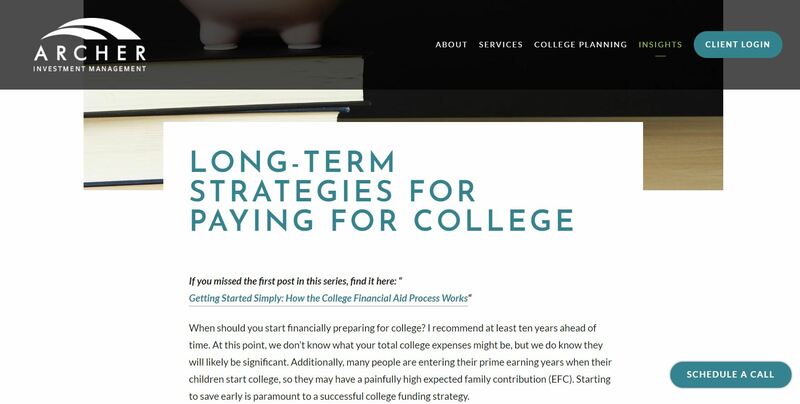 For the same group of prospects interested in “how to pay for college tuition,” you can write blog posts on different student loan options, how to pay off student loans, when to save for your child’s college fund, or even how to save during college. There are so many options that can directly target your ideal client and their questions. 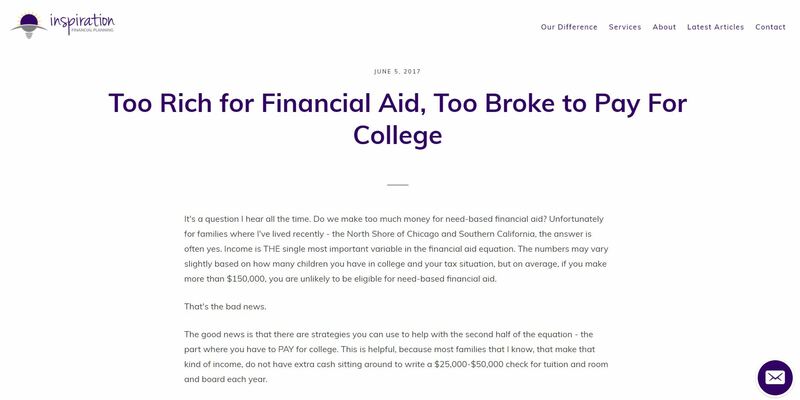 Twenty Over Ten client, Inspirational Financial Planning gives clients and prospects advice for funding college tuition on their blog. Do you work with business owners or employees? Generation X, Y, Z, or Baby Boomers? Doctors or students or entreprenuers? Whatever end of the spectrum your clients fall under, a budget can certainly be of use to them! “How to create a budget plan” was one of the most searched topics in the last year and it’s relevant for almost any client type. Writing blog posts about budgets, tips, and methods can be useful to your website viewers and increase your website traffic. Really want to set yourself apart from your competitors? Create a free download or freemium of a budget template in return for an email address. You can generate leads while providing prospects with something that is useful and segment tailored. An Exceptional Life Financial, a Twenty Over Ten Client, developed a simple 3 step budget for their readers in a recent blog post and offered a free downloadable budget template as a plus. Divorce is very common, especially in the United States. It likely affects a large chunk of your current and prospective clients. Because divorce can heavily influence their finances, it is an important topic to write about. Divorce is extremely complicated, time intensive, and usually very emotional. As a financial advisor, you can make this life changing event much easier. By providing advice on divorce alimony and other divorce financial matters through blog posts, you can provide comfort to clients, as well as increase your marketing reach. These posts make you more likely to be found in related search results and connect you with prospects in need of answers. Twenty Over Ten client, Prelude Financial, covers divorce and finances topic, including the keywords “divorce” and “alimony” throughout a recent blog post. This is definitely a topic meant for financial advisors. Stocks can seem foreign to someone who has never invested in them before. Blog posts are the perfect place to give the ins and outs of different stock options, types of stock, when to invest, and so on. The key words in this top search result is “right now.” Even if compliance stops you from listing out the stocks you purchase for your clients, you can still give them insight to industries that are rapidly growing, examples of low and high risk stocks, and simple analysis of changes in the stock market. Act Two Financial Advisors, Twenty Over Ten client, dives deep into stocks on their blog as the new year begins. We’ve found these topics to be the most trendy in searches over the last year. However, when choosing your blog topics you should always ensure that it aligns with your prospects. For financial advisors, blogs can widespread and more extensive than you might think. For example, maybe you specialize in divorce financial services. Your prospects may not only be interested in divorce alimony, but also question how they will pay for their children’s college or what retirement will look like in their post-divorce life. Earlier this month we launched Content Assist, which is available for all Twenty Over Ten users at no additional fee to help financial professionals create, promote their thought leadership and the response has been overwhelming! If you’re a current Twenty Over Ten user and not leveraging Content Assist yet, you’re really missing out! It’s totally free with your package and easy to integrate on your site. Click play below to learn more about Content Assist features and how you can start unlocking content today!